Note: The Canon EF 50mm f/1.8 II Lens has been replaced by the Canon EF 50mm f/1.8 STM Lens. The Canon EF 50mm f/1.8 II Lens delivers very sharp images as inexpensively as Canon lenses get. Build quality of the 50 f/1.8 is very cheap (as you might expect). This lens feels more like a toy than a piece of optics. It utilizes plastic contruction right down to the lens mount (the lenses are glass of course). This light material combined with the small size (2.7" x 1.6"/68.2mm x 41.0mm - WxL) puts this lens in the featherweight class - 4.6 oz (130g). The 50 f/1.8 is currently Canon's lightest. It was also Canon's shortest EOS-mount lens until the Canon EF 40mm f/2.8 STM Lens was introduced. The 50 f/1./8 bears a plastic lens mount. Considering how light the 50 f/1.8 II lens is, the plastic lens mount seems adequate from a strength perspective. You might get more wear than you wish if you are changing the lens frequently. There is not much to this lens. There is no distance window or markings. There is barely even a focus ring - and the tiny ring that is there is barely usable. Autofocus is driven by a micro motor. Focus speed is not stellar, but fine in good light with subjects that are not moving too quickly. The 50 f/1.8 II is one of Canon's louder/buzzier lenses - you know when it is focusing. But this is not a wildlife lens - and the noise probably won't bother most people. I suppose a positive aspect of the sound is that you know when it is working - and when it is finished working - when focus is locked. FTM (Full Time Manual) focusing is not included. The 50 f/1.8 extends up to 5/16" during focusing - the very small 52mm filter does not rotate. The Canon EF 50mm f/1.8 II Lens' strongest quality is its sharpness. Sharpness performance wide open (f/1.8) is decent, but the Canon 50 f/1.8 is very sharp at f/2.8 and beyond. It is slightly sharper than even the Canon EF 24-70mm f/2.8L USM Lens. With an f/1.8 maximum aperture, this is a fast lens. Unfortunately, only five non-rounded aperture blades are used in this lens. This design leads to sometimes-poor bokeh (image quality of out of focus areas). In the above comparison image, the background blur of the Canon EF 50mm f/1.2L USM Lens (left), Canon EF 50mm f/1.4 USM Lens (middle) and Canon EF 50mm f/1.8 II Lens (right) are presented. These pictures were taken using identical (neutral) settings (that include an f/2.8 aperture). A tripod was used - the camera was focused on a stationary test target. 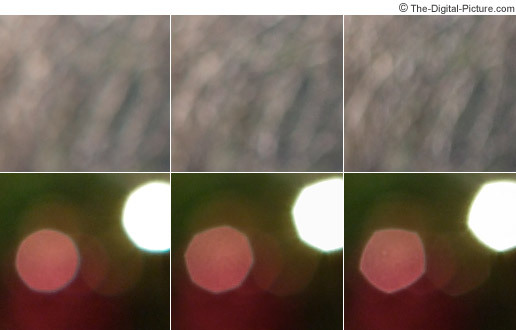 In the top row of pictures, the difference in background blur harshness is easily seen. In the lower row of pictures, the effect of the shape and quantity of the aperture blades can easily be seen even at the relatively wide f/2.8 aperture. The Canon EF 50mm f/1.8 II Lens produces the harshest blur and will give five sides to out of focus points of light. Don't like 5 sides? Try hearts. Light fall-off is noticeable through f/2.8 or so on a full frame body. When mounted on a 1.6x FOVCF body, light fall-off is basically only noticeable wide open. On a full-frame body, 50 f/1.8 II vignetting clears up about a stop later than the Canon EF 50mm f/1.4 USM Lens (the 50mm f/1.4 @ f/2 is similar to the 50mm f/1.8 @ f/2.8). Colors produced by the 50 f/1.8 II are OK, but not stellar. Especially at wide apertures, color/contrast is a step below lenses such as the 50 f/1.4. CA (Chromatic Aberration) is very low. With a minimum focus distance of 1.5' (.45m), the 50 f/1.8 II delivers a rather low native maximum magnification of .15x. Adding extension tubes take maximum magnification to .39x and .68x for 12mm and 25mm tubes respectively. These numbers are basically the same for Canon's three non-macro 50mm lenses. 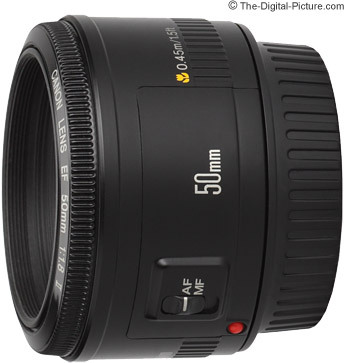 The Canon EF 50mm f/1.8 II Lens takes the optional ES-62 Lens Hood that includes the Hood Adapter 62. The hood adapter threads onto the lens - the hood then attaches to the adapter by pinching two latches. This lens ships with no lens pouch/case. A Lowepro Lens Case 1W works well (but is somewhat large) for this lens with the hood installed. Without the hood, a Lowepro Lens Case 1s would provide a more compact solution. The 50 f/1.8 has a very small 52mm filter size - 52mm filters are very inexpensive. The 50 f/1.8 II (above left with Hood Adapter 62 installed) is positioned next to Canon's other non-macro 50mm lenses - the Canon EF 50mm f/1.4 USM Lens (above center) and the Canon EF 50mm f/1.2L USM Lens (above right). The same lenses are shown below with their lens hoods in place (optional with the two non-L 50mm lenses). Moving your lens selection from the left-most lens to the right-most lens makes a huge difference in your wallet. I outline some of the differences between these three models in the other two reviews - be sure to read them before making your final purchase decision. 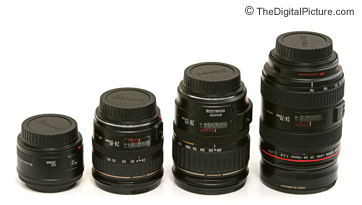 Pictured above from left to right are the Canon EF 50mm f/1.8 Lens, Canon EF 24-85mm f/3.5-4.5 USM Lens, Canon EF 28-135mm f/3.5-5.6 IS USM Lens and Canon EF 24-70mm f/2.8L USM Lens. The Canon EF 50mm f/1.8 II Lens is a good low-light indoor photography lens - especially when a flash is not appropriate or desired. It works very well in a church or gym for example. Aside from having mediocre bokeh, the 50 f/1.8 makes a good focal length for full-body portraits. If mounted on a 1.6x FOVCF camera, you will need some extra space to accomplish a full-body portrait and might also want to capture head/shoulder portraits with this lens. Need to travel light? Mount the 50 f/1.8 II on a small DSLR and you have one of the smallest, lightest and least expensive low-light combinations available. The drawbacks of the Canon EF 50mm f/1.8 II Lens are easily overlooked when one looks at the price. This lens is not for everyone, but I don't know of a better lens available for twice this price.